There is an endless list of reasons that I am without doubt my mother’s daughter. A lot of my healthy eating has been inspired by how she cooks and likes to eat. But there is no question about it. If you want to be in the Neistat family, or even liked by the Neistat family, then you better love yourself some popcorn. We love popcorn to the point of embarrassment. When my family goes to a movie it’s not a question of if we are getting popcorn, it’s who has to go refill the extra-large tub before the movie starts. I was gifted my own popcorn making machine by Ryan’s sister over the holidays, and have been making lots of crazy creations ever since. I have found a lot of great flavor popcorns on our travels around the country. Peanut butter oreo, anyone?! But most of the places I’ve seen use a spray mechanism for flavoring the popcorn. Some of those tend to taste a little fake to me. So I am beginning a voluntary quest to create great homemade popcorn recipes. There is a delicate balance of incorporating fun toppings without making your hands and face a mess. This Rosemary Parmesan Popcorn is my favorite savory flavor so far. Just a little bit of rosemary goes a long way. Mixed with the olive oil and parmesan and we have a great Italian inspired combination. Pop the popcorn according to package directions. I have an air popper which does not require butter or oil to pop. If you are making the popcorn stovetop, follow the directions for the kernels. Set popcorn aside. In a saute pan, melt the butter, olive oil, garlic salt, and minced rosemary. Cook over low-medium heat for 3-4 minutes, or until the fat is infused with the butter. Pour the oil into a large bowl and swirl is around so that it reaches around the most of the bowl. Add the popcorn and the Parmesan cheese and toss it all together with your hands. Pour onto a cookie sheet (or two if necessary) that is lined with parchment paper. 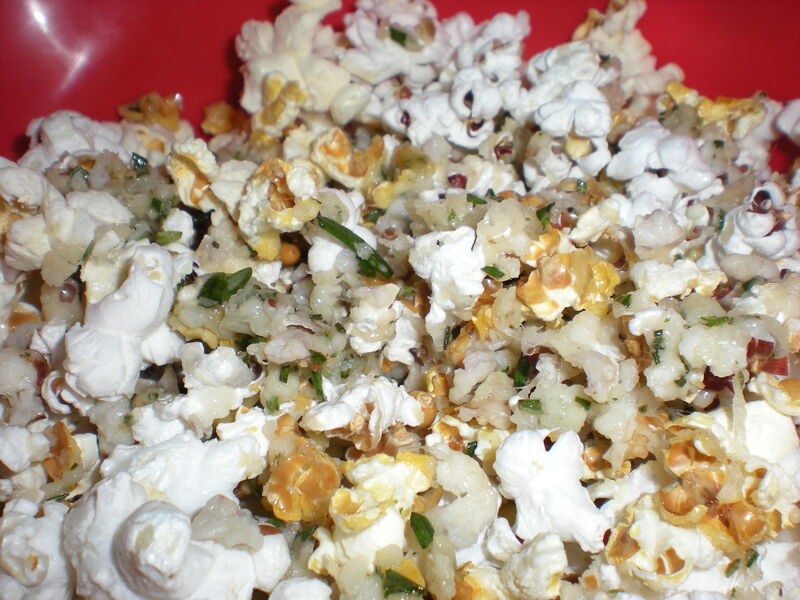 If some of the rosemary or Parmesan is sitting in the bottom of the bowl, sprinkle it on top of the popcorn. Crack some fresh pepper on top and bake in the oven for 12- 15 minutes. Stir as necessary if it starts to burn. Woo hoo, that’s my girl. Just in time for the Oscars!! !